Audit is really one of the interesting, useful yet difficult to maintain topic in history of SQL Server. I have already written few articles on how to maintain Audit trail in SQL Server. You can refer those articles from the below given links, once you will go through those articles and then read ahead this one, you will come to know how much it is easy in SQL Server 2008. Earlier people had very few options for auditing in SQL Server but in latest technology, you are having quite a good power on auditing stuff. Since this is one of the big topics in SQL Server, it is not possible to cover it completely here, though I will try to give you one detailed example herewith below. First of all when you want to use power of Audit in SQL Server 2008, you have to create AUDIT object. AUDIT object is nothing more than just a container of Audit specification on Server level as well as on database level. You can store log in Application Event Log, Security Event Log and Filesystem. I am going to create one Audit object which will act as a container of one of the database level audit specification which will keep an eye on one Schema for any DML statement executed on that schema. I will store log in D:\Audit in my server, you can change the path in given script if you wish, do create the folder and give reference in script below. –looking at what we have received in our audit file. 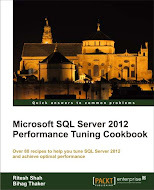 You can find detailed text on this topic from MSDN. Do look at all reference link given below the article in MSDN.